The lead-acid battery in use today, whether in an automotive (vehicle/generator) or standby power (UPS/dc power) application is not that much different in technology to that developed by Gaston Plante in 1850. The science behind them has evolved, as have the manufacturing processes. An uninterruptible power supply requires a source of DC power to power its inverter section. The inverter converts the DC supply into an AC digitally generated waveform (sine wave) to power the connected loads. When mains power is present the DC is provided by the input rectifier/charger. Lead-acid batteries are mass-produced not just for UPS systems but many other applications where a reserve of power is needed (automotive starters, fire alarms, security panels and emergency lighting). As a mass-produced item in use globally, lead-acid batteries provide a relatively low-cost energy storage device. They have become the standard energy storage unit for UPS systems by default with little alternative available and have several drawbacks. The two principle weaknesses of lead acid batteries are their need for a constant 20-25degC ambient temperature to reduce their speed of ageing. Within a data centre environment this can mean a separate battery room and/or additional energy costs for cooling. Lead acid batteries can also have a large footprint and weight, taking up valuable white or grey space that could be used for revenue generation rather than revenue protection in the form of critical power systems. Are there alternative DC energy sources? Yes. Flywheels store kinetic energy in a self-contained mass spinning at several thousand RPM within a vacuum. When the mains power fails, the mass starts to slow down and its kinetic energy can be used to power the DC bus of a UPS system, replacing the need for lead-acid batteries. Flywheel UPS systems only make sense commercially from 250kVA and above and can be scaled to 1MW and beyond. Whilst the initial costs can be up to 25-30% higher than a lead-acid based UPS system the Total Cost of Ownership (TCO) can be comparable or lower as the UPS will not require replacement batteries or a separate battery room or cooling. As a critical power source the backup time is limited to around 35seconds or less. The timeframe is sufficient to ride through most power breaks and cover the start-up period of a well-maintained standby generator. Whilst it can take up to 24-48 hours to run up a new flywheel installation, the recharge time is fast. Riello UPS is a UPS manufacturer offering a DC flywheel based UPS system. Their solution has been to integrate a Vycon manufactured flywheel with their Master three phase UPS system to create the Master VDC range. Active Power is a manufacturer with their own integrated UPS/flywheel product with over 4,000 flywheel UPS installed worldwide in data centre, industrial and medical facilities. Supercaps provide another eco-friendly short-term source of backup power that is again measured in seconds (up to 60) rather than minutes with a long working life. System sizes are relatively limited from around 1-120kVA in size. Supercaps can typically be cycled (charge/discharge) up to 1 million times compared to the 300-400 of a typical lead-acid battery and as with flywheels do not require an ambient room temperature of 20-25degC. Normally built-into the UPS system, they also provide the advantages of a compact footprint and low weight compared to lead-acid battery and UPS systems. 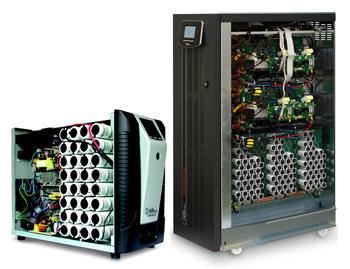 Super capacitor systems are available for special projects from UPS manufacturers including Riello and Eaton UPS. They are not standard products. In the future, lithium-ion batteries (see Wikipedia) may well provide the only viable alternative to lead-acid batteries for backup power applications. Already in use in mobile, tablet and many other consumer applications, lithium batteries are starting to make a breakthrough in energy storage for solar applications, with companies such as Tesla leading the way. In the uninterruptible power supplies market there are very few lithium-ion enabled UPS systems. This is because lithium-ion batteries require a more complex charging and temperature management system compared to the lead-acid battery charging system found in most UPS Systems. Those UPS systems available are for special projects and rely on a separate charger/temperature management system. As with a DC flywheel, the lithium-ion system is connected to the UPS dc rail and powers the inverter when the mains power supply fails. Lithium-ion batteries can also operate at higher temperatures, removing the need for additional cooling within a data centre environment. The charge/discharge cycle is faster than lead-acid (approximately 50-75% faster) and the footprint more compact. From a transportation viewpoint, lithium-ion batteries are generally transported by sea or road as most airlines have restrictions due to their flammable nature. Crushed lithium-batteries can be flammable and certainly when temperature rises above 80degC. Lithium-ion batteries face an uphill struggles to reach the mass-market penetration of lead-acid. Their adoption in electric vehicles and solar energy storage will help them achieve the higher volumes and lower unit costs. However, UPS manufacturers will have to develop more compact and lower cost charging and temperature management systems if lithium powered UPS are to be comparable in price to today’s lead-acid powered sets. In summary, the end of the lead acid battery is not nigh but it is on the horizon. Perhaps within the next 10 years we will see more wide scale usage of dc flywheels, super capacitors and lithium-ion batteries. If you have a dc flywheel, supercaps or lithium-ion UPS system application, please contact the Eco Power Projects team.